How To Get From Alicante Airport To Santa Pola and Gran Alacant? Right south of Alicante lies the city of lovely city of Santa Pola. With its beautiful harbor, large beach areas and ferries running to the Tabarca Island, it has become an important tourist attraction. Located at 15 km ( 9 miles ) south of the airport of Alicante, getting to Santa Pola is relatively easy. (Distance Alicante airport to Gran Alacant is around 10 km ( 6 miles ). However, finding a cheap public transport option like bus is not easy, especially during off season. Since we are getting the question on how do I best get from Alicante airport to Gran Alacant or Santa Pola rather frequently, we put the table below together, listing a variety of transfer options for you. How To Get To Santa Pola from Alicante Airport? The Baile S.A. bus company runs a bus service from Alicante airport to Santa Pola and Gran Alacant. Depending on the time of the year, the bus runs up to 7 times daily. ATTENTION!!! Bus runs only on Mondays through Fridays! The Baile S.A. bus from Alicante airport to Santa Pola and Gran Alacant runs only on Mondays through Fridays. Current one way ticket price bus Alicante airport to Gran Alacant is EUR 1,50 . The bus ticket from Alicante airport to Santa Pola costs EUR 2,30 . The bus stops at Alicante airport outside the departure Level 2, where the regional buses to Alicante, Benidorm, Murcia and Elche are leaving. Baile S.A. runs various local bus routes around Santa Pola, Gran Alacant, Arenales del Sol, Altet Beach, El Altet and Alicante. Most likely your best option if you are landing on weekends or outside the bus service hours. The taxi from Alicante airport will get you to Santa Pola or Gran Alacant in 15 to 20 minutes depending on traffic and where exactly are you heading to. Taxi fare is around 25 EUR to 35 EUR. No need to book anything in advance, there are plenty of taxi’s available at Alicante airport – just outside the arrival area of the terminal building. A variety of companies offers shuttle services from Alicante airport to several cities around the Costa Blanca. Depending on where you need to go to, it could be worth checking out companies like resorthoppa or shuttledirect and see what they charge for transfers to Gran Alacant or Santa Pola. Most of the time the price should be close to an ordinary taxi fare. Obviously a car rental is not really an alternative to any airport transfer, but you might at least think about it. Especially since the local public transport around Gran Alacant or Santa Pola is not excellent ( to say the least). Having a car at your disposal throughout your holidays could definitely be worth while. At least worth considering. 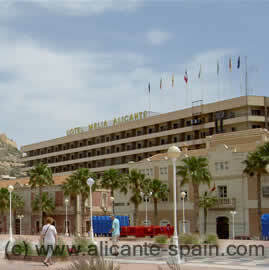 >> Find our article on where to best rent a car at the airport of Alicante here. Finally, if you came across any alternative way to get from Alicante airport to Santa Pola or Gran Alacant, please let us know in the comments section below, so we can add or update this page.